Family Volley is a fan of things that promote Reading in families. Today we have a great giveaway. Part of a blog hop that focuses on reading. Add to your families reading collection, and buy a little something for yourself. Follow Family Volley (publically) on GFC. Just click on the "follow" button on the right, or at the top left of the page. Already follow, thank you. Just let me know. Click on the link, or the button on the right. Already "Like" just let me know. 1. After you "Like" Family Volley on Facebook. Leave a comment and say hello. I will return the favor. 2. Subscribe to Family Volley by EMAIL. Enter your email in the link on the side bar. 3. Follow Family Volley on Twitter. 4. Post this giveaway on your facebook page. Linking back to this post. 5. Tweet about this giveaway. Linking back. GOOD LUCK, AND HOPPY READING! Dont' forget to Hop to the Next Blog Giveaway. Hoppy, Hoppy, Hoppy Easter ! following you on twitter. Thanks for the chance! 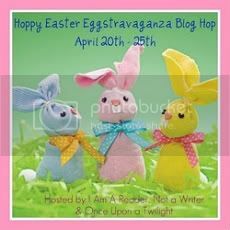 Would love if you can enter my Hoppy easter giveaway and show love to our sponsor. I like Family Volley on Facebook. And I like you facebook! I did...great stop along the hop! Post this giveaway on your facebook page. Linking back to this post. Tweet about this giveaway. Linking back. Thanks so much for participating in this blog hop! :) Love going to all the different sites :) Have a happy Easter! I posted on your facebook page. I follow you on twitter (@RosaShah). I like you on GFC and I am a new Facebook fan! I said "Hi" on Facebook! I follow by google reader under cenya2 and I liked on facebook under Marjorie R.
I commented on your FB wall! I have also "liked" your blog on Facebook. Mandatory entry: GFC follower (jennifer). Mandatory entry 2: liked facebook page: jennifer k.
After i liked you facebook page i said hello: jennifer k.
I Like (Liked??) your Facebook page. I'm a GFC follower, liked your facebook page and made a post on the facebook page. Thanks for being a part of the hop! I hope that you have a hoppy Easter! I am a GFC follower, liked your facebook page, and think you are great in general.